The Berlin artist’s lo-fi pop jam gets a fitting visual. What makes DENA's low-fi pop so alluring is the way she dishes out much-needed blunt talk without coming off as insincere. It's a hard-to-master swagger that's epitomized in her new video for "Freaking Out." The song is taken from her recent Trust EP, whose hit rate is envious. In the video, DENA's venting about an ex to a group of stone-faced love addicts is juxtaposed by vulnerable moments of coping with the break. She defaces said ex's car, holds her head underwater, and wanders sullenly through her hometown of Berlin. It's a great pairing for pop that wears its heart on its sleeve without sounding toothless. 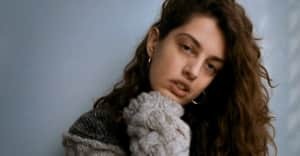 "I wrote 'Freaking Out' in a state between fever, heartbreak and lethargy, thinking that the world is going down," DENA explained to The FADER over email. "A few months later, we shot the video here in Berlin and on the first day, the white car you see in the video got stolen, alongside all clothes I was gonna wear. Luckily it was found on the next day; someone has used the car for a “joyride" and had left it on the opposite part of town with everything inside. So we were able to make the video and a production-catastrophe was prevented. 'Freaking out' was my personal state of mind whilst creating the song and visuals, but also a general feeling I was reflecting upon — the moment when you just can’t handle any more complications in love and life." DENA's Trust EP is out now on Normal Surround.